If the scar is tethered to the underlying structures then the lesion will have to be subcised (released from the tethering) which is a very simple procedure. The acne scar filler will give a great result immediately. Also over the next few months, collagen will be stimulated due to the stretching of the fibroblasts with the dermal filler. This is useful as the skin is thin in the scarred areas. Dermal fillers are used to fill the scars in patients of all ages. A problem which occurs over time with patients with scarring is: as the normal volume loss associated with aging occurs, the bone and soft tissue including fat dissolves, causing the scarring to appear worse over time. This means that to adequately treat patients with scarring, the doctor should be constantly alert to any volume loss and replace this. As scars age, wrinkles and folds will form in the scars. Dermal fillers should be injected beneath the scars to support these scars to prevent this from happening and if wrinkles have already etched in, then in addition, dermal filler should be injected to lift the wrinkle. We use several different types of dermal fillers for scarring. We cannot use their names due to Australian regulations, which makes it difficult to talk about how they compare to each other and the pros and cons of each. Permanent fillers are not suitable to be used at too superficial a depth in the skin. Our doctors will assess the scarring and decide on the best dose after taking a history and examining the patient. If a patient has a history of complications with dermal fillers, or if their budget is small or if they want a more subtle result, then a smaller dose might be chosen to start with. For volume replacement. it would depend on the anatomy how much is required. What happens during the injectables treatment for scarring itself? Skin will be cleaned with alcohol/chlorhexidine. Ice will be applied to the area briefly before treatment The doctor will inject using a very fine needle. Then pressure with gauze will be applied. If a cannula is used, a small injection of local anaesthetic is injected into the skin and then a fine needle makes a small hole in the skin where the cannula is inserted. This can be used in volume replacement. Infection is a rare complication, but always a possibility when the needle goes into the skin. Anecdotally, infections are more common in patients with acne scars who have dermal filler than those who don’t have acne scars. It may be due to the blood supply in scarred areas. Need for further treatment: It may take several syringes and treatments to get to where the patient wants to be. How will I look immediately after dermal filler in the scar? There will be redness and swelling, and red dots at many of the injection sites. 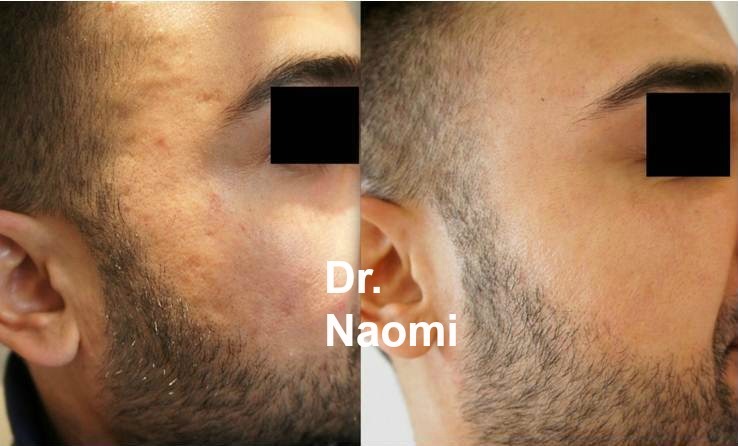 What to expect after the dermal filler treatment for scarring? When should I have my next treatment?